All week long, I kept thinking we were going to know some things after this game. Through the first 3 weeks of the season, Michigan has been sort of getting by with talent and coaching...but for reasons unexpected, Purdue suddenly presented a tougher than predicted challenge for this Michigan team. So we learned some things. We already knew that Don Brown was a defensive genius...but his stock is seemingly hitting new highs each week. His unit, which features 10 new starters this season, is now ranked first in overall defense in the country after 4 games. That alone would be enough to glean from a 28-10 win against an upstart Purdue team...but that's not all we learned yesterday. We also learned that Michigan is a different offense with John O'Korn on the field. It's not that Wilton Speight was doing anything terrible...he's just not the same QB we saw through much of last season. He just seems...off for whatever reason. On the flipside, O'Korn seemed anything but. We heard all offseason about the progress O'Korn was making and yesterday, we saw it. He looked poised, and ready, when Speight whet down. This could be due in some part to his former passing coach at Houston Tony Levine, who benched O'Korn thus leading to his transfer, is now the co-offensive coordinator at Purdue and was on the sideline yesterday. It's hard to put a fine point on it, but O'Korn just had an edge that's been missing from Speight this year. 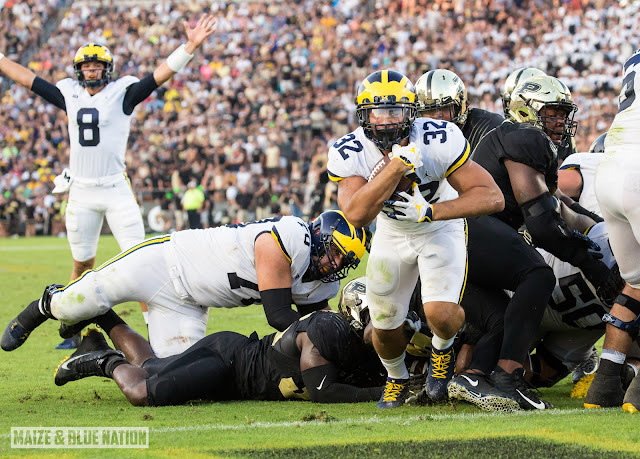 He was hitting tight ends (who have been vastly overlooked by Speight in the first 3 games) which was a welcome sight as Michigan has maybe some of the best tight ends in the country. The receivers are still a work in progress, but it wasn't just the passing game that saw new life. The running game looked improved with O'Korn...perhaps because the passing game was suddenly a threat to move the ball. Chris Evans had himself a little bit of a breakout game. By the second half, Purdue had no real answer on either side of the ball. Three second half touchdown drives, combined with five straight 3-and-outs for Purdue was essentially the ball game. Michigan was able to put the hammer down on a lesser team and score touchdowns instead of field goals...a welcome sight for Michigan fans. It's clear O'Korn has the fan vote to be starter going forward, so it'll be interesting to see what transpires, if anything publicly, during the bye week. No official word, other than a soft tissue injury, on the condition of Speight. There will be a lot of talk about a "QB controversy"...which most Michigan fans will scoff at...O'Korn is the clear fan favorite for obvious reasons. No doubt...the defense. The guys can just flat out play. Aside from being put into some tough spots in the first half, in the second, Michigan put the hammer down. In the 2nd half, they held Purdue to 10 total yards (-15 rushing and 25 passing) and were only on the field for 7:24. Not to pile on, but the offense under Speight was headed for an upset loss...despite the great play of the defense. Given he left the game because of an injury, which probably was a roughing the passer which wasn't called, we won't scrutinize too hard here. Regardless of which QB played better, I hope Speight is ok and recovers quickly. Yesterday he was 18 of 26 for 270 yards and 1 TD and 1 pick. His completion percentage was an impressive 69% with a 10.4 yards per attempt. No question about it, he doesn't look like the same O'Korn we saw last year. Stats aside, he just looked much more comfortable and in command of the offense than he did against Indiana last year. He was everywhere...again. He led the team in tackles with 6, 1 sack, 1 tackle for loss and 1 pass breakup. His real impact was not felt on the stat sheet, but rather on the field. I don't know what counts as a QB hurry on Michigan's stat site, but no one had any...which is hard to believe because both Purdue quarterbacks were on the run all day...mostly because of Devin Bush. Robbins spent more than half of the game being called 'Quinn Nordin' by the FOX commentators because he wears the same number as Wild Thing. But given that Nordin only kicked 4 extra points, DPJ only fair caught punts and Kekoa Crawford only had 1 kickoff return for 15 yards...Brad Robbins, with his 7 punts and 40.6 yard average gets the nod this week. What else can we say...the guy is just a defensive genius. In 4 games he took 10 new starters and turned them into the #1 overall defense in the country. Some other rankings of note for this group...4th in rushing D, 8th in passing, 5th in pass efficiency and 12th in scoring.